George Em Karniadakis, a joint appointee with Pacific Northwest National Laboratory and Brown University, was awarded the Ralph E. Kleinman Prize, which is sponsored by the Society for Industrial and Applied Mathematics (SIAM) to recognize individual achievement for outstanding research or contributions that bridge the gap between mathematics and applications. 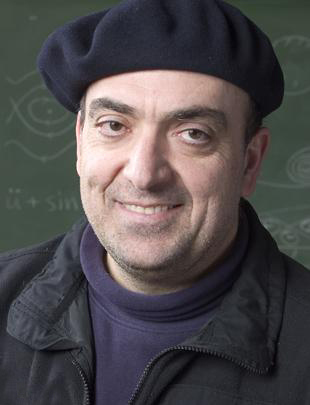 Karniadakis will receive the Kleinman Prize during an award ceremony at the International Congress on Industrial and Applied Mathematics (ICIAM 2015) to be held in Beijing from August 10-14, 2015. At PNNL, Karniadakis serves as principal investigator of the Collaboratory on Mathematics for Mesoscopic Modeling of Materials (CM4), a major project sponsored by the Applied Mathematics Program within the U.S. Department of Energy’s Office of Advanced Scientific Computing Research. CM4 focuses on developing rigorous mathematical foundations for understanding and controlling fundamental mechanisms in mesoscale processes to enable scalable synthesis of complex materials. At Brown University, he is the Charles Pitts Robinson and John Palmer Barstow Professor of Applied Mathematics. In addition, he has been a visiting professor and senior lecturer at the Massachusetts Institute of Technology since 2000, where he also earned his Ph.D. in 1987. He is a Fellow of SIAM, American Physical Society, and American Society of Mechanical Engineers, as well as an Associate Fellow of the American Institute of Aeronautics and Astronautics. He received the Computational Fluid Dynamics Award (2007) and the J. Tinsley Oden Medal (2013) from the U.S. Association in Computational Mechanics.